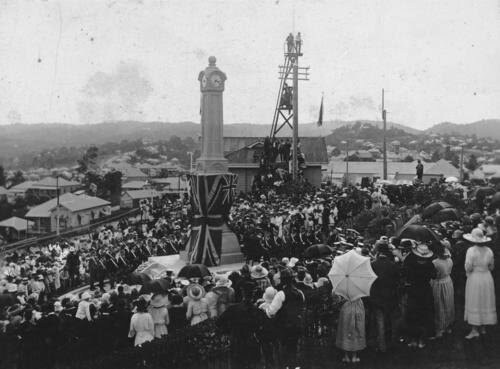 The town of Ithaca, which featured its own town hall prior to the amalgamation of the local councils into the Greater Brisbane Council, raised a monument to its fallen WWI servicemen in 1922. 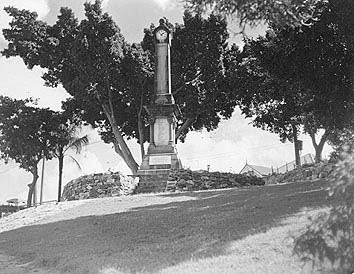 It was erected in a park further along Enoggera Terrace from the town hall, right next to the fire station. Here is a photograph of the unveiling of the monument on 25th February 1922. I notice that the flag draped over the monument is the Union Jack. This war memorial was different from many others in that there was a four-sided clock mounted in the top of the monument, the only one in Brisbane. About 417,00 Australians embarked on overseas service for WWI, and 65% of them became casualties of some description. At the end of the war, many communities were moved to remember those who did not return from the "Great War", and Ithaca built this monument to commemorate the 130 of its sons who died. Their names are inscribed on the monument. The park is now known as the Ithaca Memorial Park. It remains in its original position next to the Ithaca Fire Station, in the suburb now called Paddington. - to make up for the lack of a son or husband's actual grave? - as a public site for honour, by the entire community? - as a public site for community services and marches? - so the individual names won't be forgotten? The Paddington memorial looks as if it was located in a green and shady spot - a pleasant space for the citizens to go to. I find it interesting too,Hels. As well as monuments like this one, I have also recorded a Catholic church, the Freemason's temple and an Anglican hospital that were erected as WWI memorials. The hope that the Great War would be the last such war (Fail! ), together with the sheer number of volunteers from Australia - so many of them killed or injured - must have been a very emotional time for Australians.